Precious metals posted another day of losses Thursday. Gold closed at a fresh seven-week low and advanced its losing streak to six straight sessions. Gold for December delivery shed $2, or 0.2%, to end at $1,104.20 an ounce on the Comex division of the New York Mercantile Exchange. The settlement was the lowest since Sept. 15 when prices finished at $1,102.60 an ounce. "The yellow metal is now hovering just above key psychological support at $1,100.00 heading into Friday morning’s important U.S. jobs report," Jim Wyckoff, a senior analyst at Kitco Metals Inc., said in a report. "Traders and investors are awaiting Friday’s U.S. employment report from the Labor Department, which is arguably the most important data point of the week, if not the month," Wyckoff added. Gold prices traded from a low of $1,103.60 to a high of $1,111.30. They have turned down 3.3% this week. Dropping for a fourth consecutive day, silver for December delivery lost 8 cents, or 0.5%, to settle at $14.98 an ounce. The close was the lowest since Oct. 1. Silver prices ranged from $14.91 to $15.09. They are down on the week by 3.8%. January platinum dipped $1.70, or 0.2%, to $953.10 an ounce, trading between $950.50 and $961. Palladium for December delivery tumbled $17.10, or 2.7%, to $606.30 an ounce, ranging from $602.80 to $631.45. Gold fell $8.40, or 0.8%, to $1,106.30 an ounce. Silver dropped 24 cents, or 1.6%, to $15.02 an ounce. 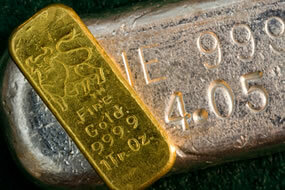 United States Mint bullion sales were unchanged as of 4:33 p.m. ET. Below is a listing of U.S. Mint bullion products with the number of coins sold during varying periods. Products with an asterisk (*) are no longer available.